New fruit-based spirits are now being served at FruitCraft: Fermentery + Distillery. It’s an evolution and name change for The California Fruit Wine Co., which moved into an urban winery space in Hillcrest last fall. Brian Haghighi, who co-founded the company with his brother Alan back in 2009, says that the shift and expansion was made in order to better connect the brand to other booming craft beverage categories. FruitCraft’s original line of fruit-based wine is made from high quality produce without artificial flavors or added colors. By aligning themselves with the world of craft beer and craft spirits rather than traditional wine realm, Haghighi told Eater that the company will have more creative freedom with its offerings. To that end, FruitCraft has contracted with a distillery to produce double-distilled eau de vies, or fruit brandies, in flavors of pomegranate, cranberry, mango and pineapple. The spirits are being featured in straightforward cocktails served in the tasting room and will soon be available to taste by the flight, joining the fermentery’s house wine on tap and a menu of snacks, flatbreads and salads, with entrees to come. Future plans also include an on-site distillery, which should come online this fall along with retail bottles of the eau de vies. 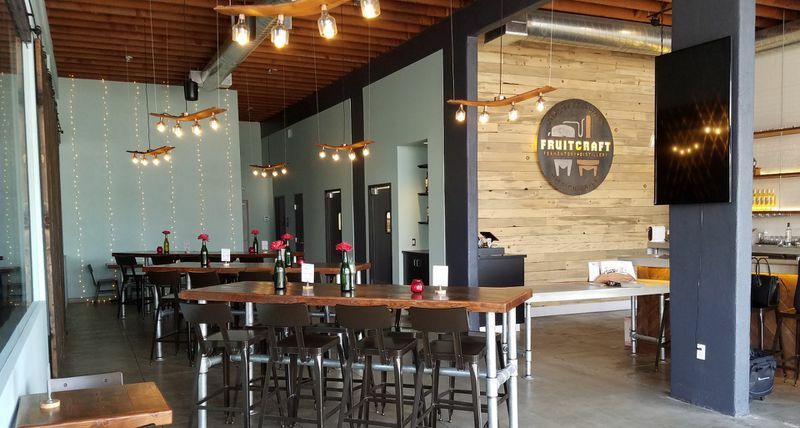 Haghighi says FruitCraft: Fermentery + Distillery hopes to open a similar facility in North County later this year, with the aim of launching locations in Austin and Portland next year.